This adorable Target gift card really exudes holiday cheer. Just looking at Santa’s rosy cheeks can’t help but make you smile. The card is cut out in the shape of Santa and the holiday-themed sweater is a really nice touch. 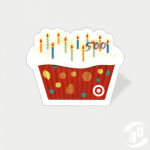 This design is not currently available for sale on Target’s website.